We recommend the use of a Water Resistive Barrier (WRB) applied to the exterior sheathing (OS or other) and the use of an adhesive or flexible flashing product to seal around the opening. The WRB should be cut in the opening (following manufacturer’s guidelines) with the head of the flap taped up, to be sealed later in Step 11. The flashing should be applied in an overlapping manner as shown, always working from the bottom up (follow manufacturer’s guidelines). Use only the PVC cement provided in the sill pan kit to flue the pieces together. The sill pan must be sealed to the sub-floor using an Elastomeric or Polyurethane sealant, but do not apply sealant to the bottom of the sill when using a sill pan. Remove cleat and packaging, but keep door fastened closed with transport clip Do Not remove the transport clip until instructed to do so later in Step 7. Is the opening the correct size for the door unit? Check it against the door frame size now, before installation. The opening should be frame height plus 1/2” and frame width plus 1/2” to 3/4.” Fix any problems now. If additional floor covering clearance is required, attach the shim board to the sub floor. Be sure to caulk well under the shim board. Is the opening square? Check all corners with a framing square. Double check by comparing diagonal measurements. Fix any problems now. Check to be sure the framing walls around the opening are in the same lane. Do this by performing a “ ring test” for plumb. String Test for Plumb: Attach a string diagonally across the opening from the outside, as shown. The string(s) should gently touch in the center, if not the opening is “out of plum” by twice that distance and needs to be corrected. Flip the string over itself to check both planes. Fix any problems now. **An “out of plumb” condition is one of the most common reasons door units leak air and water. On the sub floor at opening place 3 very large beads of sealant. Run beads full width of the opening. Place the right and left sill pan ends onto the caulk beads and tightly against the side of the opening. Then liberally coat the overlapped areas and the recessed areas of the pieces with the PV cement provided. Place center section(s) in position and hold pieces together long enough to ensure a good bond. For added protection spread a bead of caulk along the glue joints and to prevent air infiltration, run a bead of caulk along the lower interior edge of a sill an. 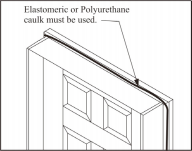 Additional caulking could affect the performance of the sill pan. Do Not Caulk the bottom of the Sill when using a Sill Pan. Lay the door unit on edge or face so that the bottom surface of the sill can be caulked.Place very large beads of caulk across the full width of the sill. Additionally, place beads of caulk along the junction of the sill and the jamb and on the bottom surface of the jambs and brickmould. 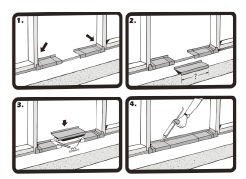 If a sill extender is used, place a large bead of caulk at the junction of the extender and the sill approach. Apply sealant to the back side of brickmould around the entire perimeter of the door unit. A 1/2 - 5/8” bead of Elastomeric or Polyurethane caulk is essential. Lift the unit up. With top edge tilted away from opening, center the unit and place sill down onto sill pan or caulk beads and tilt into opening. For all door unit configurations, note the hinge location and mark those locations on the jamb faces near the door surfaces. Pre-drill 1/8 inch diameter holes at these locations for screw placement. A counter sink bit will help conceal the screw heads. Install screws in the center pre-drilled hole locations on both jambs to temporarily secure the unit in the place. Do not drive screws completely in at this time. Use #8 x 2-1/2” or 3” exterior grade screws. Do Not Fasten through the brickmould. Work from side of the door that is weatherstripped. Use a 6’ level and plumb the hinge side jamb both ways (right to left and inside to outside). 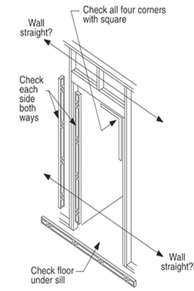 Place screws through the hinge side jamb into the studs, at each remaining hinge location, as shown in the diagrams. Use #8 x 2-1/2” or 3” exterior grade screws. Do Not, drive the screws completely in at this time.For Single or Double Doors, place screws at each hinge location, so shims can be placed behind hinges above screws. The screws will keep the shims from falling down while adjustments are being made. 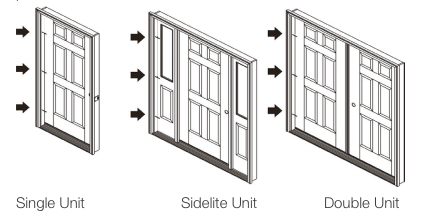 For Sidelite units, fasten the jamb on then hinge side of the door. For Double Door and Patio Units, fasten the fixed or passive side of the unit first. Step 5: Shim at Hinge Locations and Secure Hinge Jamb. Leave door fastened and closed with transport clip..
Shim above screws, behind each hinge location, between the opening and the jamb. Use a 6 foot level and re-check hinge jamb to ensure it is plumb and straight. Finish driving screws tight in the middle first then top and bottom last. From the weatherstrip side of the door, check weatherstrip margins and contact. Make frame adjustments so the weatherstrip contacts the door surface equally at the top, middle and bottom, an even 3/8” to 1/2” when fully closed. Secure the lock side jamb with #8 x 2-1/2 or 3” screws through pre-drilled holes at the top and bottom. Do not drive screws tight at this time. 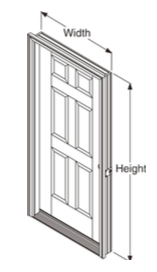 From the swing side of the door, shim above the screw locations and make adjustments so the margins between the door and frame are even top to bottom. 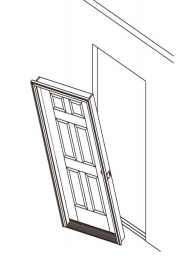 For Double Doors, make adjustments that effect the alignment, margins and weatherstrip contact between the doors. Also follow the Astragal Site Package Instructions for details on properly setting the slide bolt hole locations. Re-Check everywhere for plumb and square, and an even weatherstrip contact. Open and close door to check for smooth operation. With the door open, drill 1/8” diameter pilot holes in the top hinge in the 2 screw hole locations closest to the weatherstrip. Then, install the #10 x 2-1/2” screws (provided) through the hinge, into the stud, to anchor the door frame and prevent sagging. For Sidelite and Patio Units: With the door open, check to determine if the 2-1/2" long hinge screws were pre-installed in the hinges. If not, drill 1/8" diameter pilot holes and install the long hinge screws in the hole locations closest to the weatherstrip. Adjust strike plate in or out for proper weatherstrip contact and door operation, then finish tightening screws. Your door unit may have an adjustable threshold cap. When properly adjusted, it should be snug and slightly difficult to pull a dollar bill out from under the door when it is fully closed. The dollar bill should be able to be removed without tearing. After adjusting the threshold cap, ensure that the weatherstrip is flush with the top of the threshold cap. Trim as necessary. Apply sealant (Polyurethane or Elastomeric) at the joint where the threshold cap meets the door jambs. Remove the self-stick paper from the corner seal pads and apply to the door jamb, with the bottom lined up evenly with the top of the threshold cap. When the pad is correctly installed, the tab is on top and the narrow part is on the bottom. Shim above mull post or jambs separating doors and sidelites. Screw through the frame into the header, adjacent to the shims. Place temporary shims above the center of the head frame, where doors meet. Pre-drill and insert a screw through frame into header, then remove the temporary shims. Shim above the mull post(s), pre-drill and insert a screw through the frame into the header, at either side of the post. Provide and maintain a properly installed cap or head flashing to protect top of surfaces from water intrusion damage. 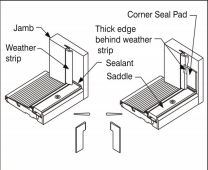 Tape and properly seal the top flap of the Water Resistive Barrier (WRB) over the head flashing. Caulk around entire "weather" side of unit, sealing along the brickmould to the flashing material or siding and seal all joints between the jambs and moldings. Seal the joints between the exterior hardware trim and the door face to prevent air and water infiltration. Place and set galvanized finish nails through the brickmold around the perimeter. Use exterior grade screws if you are installing a storm door to the brickmould. Countersink all fasteners and cover with exterior grade putty. Add insulation material to the cavity between the opening and the unit to reduce air infiltration and heat transfer. All Therma-Tru Steel doors must be finished within several days of the installation date for continued warranty coverage. For Fiberglass doors the finishing requirement is within 6 months of installation. Paint or stain according to Therma-Tru Finishing instructions. Do Not paint or stain the weatherstrip, it is "friction-fit" and easily removed for painting or staining.All 6 sides of the doors must be finished. For out-swing doors the sides, top and bottom must be inspected and maintained as regularly as all other surfaces. All bare wood surfaces such as the door frame exposed to weather should be primed and painted or stained and top coated within two weeks of exposure for best performance. To Paint Doors: Clean first with a mild detergent and water or use a TSP (tri-sodium phosphate) solution. Rinse well and allow it to dry completely. Mask off the hardware, glass and remove weatherstripping before painting. Use high-uqlity acrylic latex house paint, following manufacturer's directions for application. Use exterior grade finishes for outside surfaces. Paint edges and exposed ends of door. Remove any exess glazing ealant by first spraying with a window cleaner or water. Use a single edge razor blade to score the glazing along the edge of the frame. Holding the razor blade at a 45 degree angle, scrape glazing from glass. Wipe remaining residue off with window cleaner or mineral spirits. Clean frame with a mild detergent and water, or use a TSP solution. Rinse well and allow to dry completely. Mask off glass. Prime door lite frames with an alkyd- or acrylic-based primer. Allow primer to dry before applying finish paint coats. Use high-quality acrylic latex house paint, following manufacturer's application instructions. Use exterior grade finishes for outside surfaces. To Finish Doorlite Frames and Panel Inserts: Remove any excess glazing sealant by first sprying with a window cleaner or water. Use a single edge razor blade to score the glazing along the edge of the frame. Holding the razor blade at a 45° angle, scrape glazing from glass. Wipe remaining residue off with window cleaner or mineral spirits. Mask off glass. Paint or stain using same materials as for the door. Clean first with a mild detergent and water or use a TSP (tri-sodium phosphate) solution. Rinse well and allow to dry completely. Prime with an alkyd- or acrylic- based primer. Allow primer to dry completely, then paint with acrylic latex house paint, following the paint manufactuer's application instructions. Use a primer and paint that areas that are compatible. Use exterior grade finishes for outside surfaces. Paint edges and exposed ends of door. Clean first with a clean cloth and mineral spirits and allow to air dry or wash door with mild detergent and water, or a TSP (tri-sodium phosphate) solution. Rinse well and allow to dry completely. For stained surfaces, we only recommend the use of the stain and clear coat products found the the Therma-Tru Same-Day Stain Finishing Kit. Apply stain with a rag. The longer the stain is left to "setup" before wiping off, the darker the color will be. Using a clean rag, wpe off the stain to the color shade you desire. Remove any excess stain from the panel grooves with the foam brush provided; allow the stain to dry for at least 6 hours before applying topcoat. See Therma-Tru Same-Day stain Finishing Kit instructions for compete details. Modification or machining of this product can release wood dust, a substance known to the State of California to cause cancer.